The KARMAS Interactive Launcher is our pick for the best automatic fetch machine, which can be used both by dogs and by kids for playing catch as well. It can be used by dogs of all sizes and ages due to its adjustable power settings. Our step-up pick is the iFetch Too Interactive and it can be used for both standard and large tennis balls. It is portable in its design and sleek in its looks. You can also change the power or throwing distance and it has a random distance generator. The budget pick is the Kleeger Automatic and it is ideal for small dogs and puppies for learning how to catch the ball. It has a safe distance so it is also great for those with small compounds and homes. Playing fetch is a great way to enjoy quality time with your dog. It is a classic game that most dog owners love to do with their pet. It forms a good bonding relationship between the owner and the beloved pet. It is also the easiest way that most pet owners are able to employ with their pet because you only need to toss an object and have your pet fetch it. 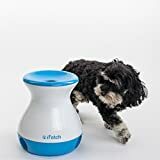 An automatic fetching machine can be useful for people who live busy lives but want to keep their dogs bust and active, especially for dog breeds that need more exercise (see below). They can be a great way to keep your dog motivated and active even when you are busy attending to other matters, but should not be a thorough replacement for a human owner. Different dog breeds require a specific amount of play time because of their energy levels. For instance, certain active dog breeds require more exercise and playtime outside because they may be prone to behavioral issues with lack of outdoor time. This is why you need to research about your dog breed and its need for physical activities. Exercise is important for dogs to avoid obesity and depression. Without proper exercise, your dog will eat too much and get fat sooner and will be prone to certain health problems, which is more likely to happen with those with history of obesity. Depression and anxiety due to boredom is also likely to occur in your dog with lack of physical and mental activities on a daily basis. The object to be fetched must be durable for a dog to handle. In this way, the ball or whatever object must not be easily ripped to shreds because dogs usually have sharper teeth than human beings. The materials need to be durable if you are going to hand it over to your dog to avoid purchasing a fetch toy over and over again. The object to be fetched should also be safe for a dog to bite on. Because some chemicals can be harsh for both dogs and humans, they should not go into the mouth of your pet. Consider looking up the list of ingredients that your fetch material is made of. Ease of operation: this refers to how easy will it be to operate as a machine that will be used for dogs to catch the ball or object that the owner wants them to catch. The controls should be simple and straightforward, as it will be mostly used in an automated manner. If it has a remote then it should have an effective distance of coverage so that you can control it easily from anywhere and anytime you like. Number of balls: the number of balls that is allowed per set of the machine is important so that you will not break the machine with too much or too little balls in it. Consider how many balls you can fit inside the machine so that it will not be troublesome for you later on when you try to load the balls in it. Throwing distance: you have to know its power when it comes down to throwing the ball. Effectively throwing at a larger distance is okay but you should be mindful that the ball does not get thrown out of your fence and off to your neighbor’s house. It should have good control for the throwing distance to avoid unwanted accidents. Type of balls used: the balls that will be used for this kind of machine should be of high quality so that it will not be easily gnawed by the dog or your pet. It should also have indications on what kinds of balls you can use, such as tennis balls, so that you can provide it even without having to find one that comes as a set, or if the included balls get lost or damaged, so you can easily provide balls again. Size or age of dog: you should also consider how old your dog is and its breed. Most breeds are too small to catch bigger and farther distances so they should only settle for smaller machines. However, some breeds can take up catching sprees of many distances so they are okay for those mechanisms that have more distance coverage in catching and throwing. As our top pick, the KARMAS Interactive Launcher is a great choice for dogs that want an interactive play even when their owner is away. You can choose from distances such as 10 feet, 20 feet or 30 feet. It can be used both indoors and outdoors due to the soft tossing technique. The tennis balls included are non abrasive and each pack has 3 balls for you to use. These balls are no ordinary balls as they are deemed safe for pets due to their design. The battery is rechargeable so you can just charge it before using. Even puppies can also make use of this product in order to have fun while outdoors and to get a workout. The only con but not a deal breaker with the KARMAS Interactive Launcher is that it runs on rechargeable battery, which may require some charging time, but this is true for most portable ones, anyway. As our step-up pick, the iFetch Too Interactive has a selection of distances as well, such as 10 feet, 25 feet and even up to 40 feet. The cool thing about this one is that there is a random mode in which the device will randomly pick a distance so that the dog will not expect things to be easy all the time. The battery is rechargeable so that you do not need to replace the battery. It also uses 3 tennis balls that are of dog-grade so it is not harmful for your pet, due to lacking abrasive properties. Each of the balls are at 2.5 inches in diameter. The machine can also work well indoors just as it does outdoors, just make sure to lock the distance into the shorter one at 10 feet. As our budget pick, the Kleeger Automatic can have a maximum distance of 12 feet, so it is just right for indoor playing as well as for puppies. It has a simple mechanism that lets you throw balls for your pet to catch. It can also be used for outdoor spaces, especially if your surroundings aren’t that big or wide for your backyard or front yard. The funnel system makes it easy to load and to launch the balls. The device also speaks so that it will mimic the dog’s master as you prompt it to catch the ball while you are busy with other things. Also, the red and white color makes it distinctly attractive for dogs to see. It has a total of 3 balls included in the setup for you to use right away. The PetSafe Ball Launcher is a great choice for those who want something that has a motion sensor so that it will be safe to use even indoors. It has a range of up to 30 feet and it has 6 angle settings so you can customize the throw style of the ball. There are also 9 settings to choose from and its motion sensor can detect up to 7 feet of distance. It can be a great training tool for your puppy or dog. There is also a 15-minute rest for each throw so that your pet doesn’t get worked up too much. 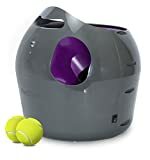 The Couch Potato Playball is a great machine that can be used for small dogs and it can easily use the included balls at 1.5 inches in diameter. It can be used for both indoor and outdoor use and it is powered by 6 batteries (sold separately). It has 3 distance settings and the included balls are also saliva resistant. The large hole allows your dog to easily put back the ball where it belongs. If you want something that is extremely portable in its design, the iFetch Frenzy Mini might be a great choice. It can handle included tennis balls at 1.6 inches in diameter each. There are 3 balls in one set and all of them are non-abrasive so they are safe to use for your pets. There is also a bottom storage for ease of cleaning when not in use. It can roll out the balls within 12 feet of distance depending on the distance that you pick. 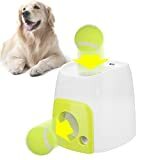 It will keep your pet entertained for hours and it has 3 chutes so that your dog will definitely try to guess which one will the ball come out of. 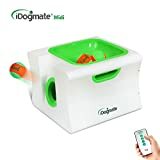 If you want something that is remote controlled, the iDogmate Ball Launcher is a good choice. It can be set from 10 to 50 feet of tossing distance and even has a random setting for you to play with for your pet. It can run on either AC power or lithium ion batteries for recharging. There are also wheels that prevent jamming for the balls. There are 4 distance settings to choose from and the power of the battery can run for up to 1,000 launches in just one single charge. The balls resemble tennis balls but fit well into your dog’s mouth without hurting them. The Etna Gotcha Talking is a great choice for those who want tennis balls to be used when tossing and playing catch. It can be operated by yourself or you can let your dog operate it on its own due to the adequate size. It is also great for most pups and small dog breeds. It comes with 3 tennis balls that are safe for dogs to catch. It runs with 4 C shaped batteries or you can also use an AC adapter. There are also audible sounds for your dog to get motivated for each catch that it makes from the device. The Max Launcher Dog is a uniquely designed device that not only has a ball launcher but also has a Frisbee launcher. It is quite durable in its construction and can be adjusted from 40 to 90 feet in its throwing distance. The fact that you can use either a Frisbee or a ball to launch for your dog makes the fun and excitement of outdoor play all the more interesting for you and your pet. The Angelwing Throw Ball is a great choice for indoor use because it only rolls the ball instead of throwing it, making it safe for indoor activities. It comes with tennis balls that are safe for your pet and it is also very easy to use. Its material for the housing is made with ABS material but is still dog-grade so that it won’t harm your pet. Others were not that effective, were not easy to set up with their settings and were also unrealistic in their movements. It is important for a fetching machine to be slightly realistic as much as possible so your dog can feel like its owner is still there. Q: Why do dogs love to play catch? 1. It helps keep them interested and active, like a sport. 2. It usually satisfies their curiosity. 3. If they get bored, they will most likely get into an activity like this. Q: Why should you exercise your dog? It helps them hold their weight better to avoid obesity. They’ll sleep more and be less hyperactive at night. Exercising with your dog is a great bonding activity. It also helps your dog feel more confident about himself. Regular exercise also prevents the likelihood of stomach disorders. Overall, you are maintaining a healthy dog with proper exercise. This includes excessive barking, digging, wrecking your furniture and other annoying things. Q: What happens if you don’t exercise your dog? 1. Your dog can potentially get out of shape. If you don't exercise your dog, you are bound to have an obese and unhealthy pet later on, which can lead to many health problems in the future. Like you, they need to burn the carbs, fat and protein from that steak meal and play catch or train with you, in order to stay healthy all the way. 2. Your dog can have behavioral problems and can destroy your home. 3. Your dog may be more prone to other health problems. Q: What mistakes could I be making when exercising my dog? Q: What training problems could happen with my dog? 1. Not having enough time to train. 2. Training too late for your dog. 3. Wrong training program for your dog’s age, size or breed. 6. Disciplining your dog too much. 7. Reward positive behavior with a short word. 8. Don’t associate calling your dog with something he/she did wrong. 9. Don’t ignore your dog when it does something wrong. 10. Practice commands in different situations. This can be difficult, but it should be done because your dog might not listen if it is surrounded by distractions. Q: Why are catch machines great for dogs? A: A catch machine is a great choice for those who live a busy life when it comes down to taking care of their dogs, keeping them active and giving them interesting games. Most people do not have a lot of time to play catch with their dog, especially on a busy schedule. It helps them stimulate their muscles so they become healthier. It also exercises their brain and their thinking skills. They will learn how to do things on their own. Catch is always a fun game to play. Q: Which dog breeds require a lot of exercise? 1. Dalmatian – known as the spotted dog in Disney’s “101 Dalmatians”, this breed is very great at running far distances so you might need to jog with it more often. 2. Weimaraner – a slightly thin dog breed with short coat, this one also excels with speed, but they are definitely faster than the Dalmatian. They are also good with brain processing. 3. Golden Retriever – if you’d like a swimming partner then this dog breed is probably for you. It is not just a popular breed, but also a very active one. Whether you’re keeping it for game hunting (hence, “retriever”) or just for a family dog, the Golden Retriever is indeed very strong. 4. Labrador Retriever – much like the Golden Retriever, the “Labs” are known to be used by game hunters as well, hence their name. they are definitely great for active running and other fun sports and activities for pets. 5. Australian Shepherd – a little similar in appearance to the German Shepherd, although more similar to a Husky, this dog breed has tons of energy and are great for companionship. They are mostly a herding dog breed so they will be most likely useful at the field. 6. Rhodesian Ridgeback – this breed is very good at hunting as well, so they will be great at endurance and running. If you are a sporty person then this breed is definitely a great choice for you. 7. Border Collie – another well-known herding dog, the Border Collie is known to be an active pet for you. They have tons of energy and they will also make great working dogs. 8. Siberian Husky – of course, because they are born to pull sleds and are well-known as sled dogs, it is no surprise that a Husk will require tons of exercise and playtime outdoors, or even indoors, due to their extreme amount of energy. 9. German Shepherd – much like the Australian Shepherd, it is a work dog that you will most likely find in the police or in the military, usually as part of the canine units to sniff out bombs that can control terrorism. They are very hardworking and may need a lot of exercise. 10. Pointer – also a great duck and game hunting companion, the Pointer is a great breed to work with. They are good with their energy levels and will keep up with most athletes out there. 11. Irish Setter – the Irish Setter is a great competition for running and athleticism. If you want a high energy dog that will go alongside you on your cross training or trail blazing, this is a good breed to have. 12. Boxer – they are a great breed to consider if you want someone to guard your home and at the same time, have more energy for playtime such as playing catch. They can be lean and mean to scare off the bad guys off your property. 13. Catahoula Leopard Dog – this kind of breed is meant for herding, hence it is very much a hard worker when it comes down to it, so they will need a lot of exercise later on. 14. Jack Russell Terrier – don’t be fooled by its small appearance! Terrier breeds like these can pack a lot of energy and sporting interest, as they are also meant for hunting. 15. Boston Terrier – if your regular mandate is to jog early with a dog then this breed is a must-have. It is not for those with very busy lifestyles, but it is meant for those who have a lot of time to pay attention to their dog’s desire to burn energy. Note: If you pick the right breed that is neither too energetic nor too low in activity, you can just maintain the right amount of exercise needs. A high energy dog will best fit those with active lifestyles while those with busy lifestyles should just get a dog breed that does not require too much exercise. Q: On the other hand, which dog breeds require little exercise? The classic bulldog likes to lounge around sofas and couches, hence making them a great companion for the lazybones and those with lack of time to do some workouts. This breed also doesn’t require a lot of exercise and they are also calm in their personality. They are also very calm and cuddly, and they will only require a daily walk at the very most. Much like the traditional bulldog, the French one will require less exercise and you can just leave them on the couch all day. This is another dog breed that will also be okay even with minimal amounts of exercise every single day. They don’t require a lot of exercise but the hairless nature may be something that is a little tricky. Contrary to the Chinese Crested, the Shih Tzu can be hard to take care of due to its long coat or hair, but it is very low maintenance on exercise, except for some indoor playing. They may look playful but they don’t require a lot of walks so you can just play with them indoors. They are another toy breed that you can just chill with instead of having to walk or play catch with them all the time. It is a nice breed to chill with if you don’t prefer long walks and jogging all the time. Even though the Sussex Spaniel is a hunting breed, it actually loves to chill around, contrary to other hunting dogs. Similar to the Sussex Spaniel, they’re now a lounging canine rather than their old use as a dog of the military. Q: What are some common misconceptions with dog training? Myth # 1: Old dogs can’t learn new tricks. - Absolutely not, every dog can learn at any age! It’s just a matter of patience, trial and error, as well as determination and the will to teach your dog new tricks. Myth # 2: Dogs eventually forget old habits. - No, they won’t always do that. Pets don’t always have the mentality of humans, and they need support and discipline from a human trainer like you. Myth # 3: Aggression happens if you play tug with them. - This depends on what rules are enforced. They should not come in contact with human skin and you should control the game rather than let them control you, so that aggression won’t happen. Myth # 4: Bully breeds should never learn tug. - This the same as the above mentioned myth. All dog breeds have the right to learn tug, as long as you are letting them do it in a controlled environment so as not to cause aggression. Myth # 5: Nose rubbing can help in house training. - Actually, this is not that helpful, since your dog won’t really understand why you are rubbing its nose after an accident in the house. You can try a different way of house training it. Myth # 6: You must have an assertive or leader-like personality to train a dog. - Not all the time, anyone with the right mindset to train a dog will definitely train them well. Dogs may have descended from wolves but that doesn’t mean they completely share the same characteristics with your domesticated canine friend. Myth # 7: Only intelligent breeds can be trained properly. - Nah, all breeds can be trained well, with a lot of patience! It all depends on you on how you approach the dog’s behavior and research on how you need to work on its training program better. Myth # 8: Some dogs are just too stubborn to learn. - Yes, people and dogs both get stubborn at times, but you can correct it! Stubborn behavior is likely caused by something, such as fear, pain, anxiety and other factors. Consider looking into signs and addressing what makes your dog not listen to your commands and correct it. Myth # 9: Six months old is the best time to train a puppy. - Actually, you can start training your puppy right away when it gets active and moves around the house. If you train your dog too late then it will be much more difficult for you later on. Myth # 10: Positive training won’t work on aggressive dog breeds. - Actually, all dog breeds need positive training, most especially aggressive dog breeds. Aggressive training will only lead to aggression, as hate leads to more hate, so it’s better to just throw back patience and happiness so they will follow suit. Myth # 11: Food should not be used as a reward. - While giving too much food can cause obesity, given that it is done properly and sparingly, food is a good motivator for dogs! Myth # 12: Fido is mad at me if he pees on my bed. - Not necessarily true, because this is a train of thought that is only applicable to humans. Dogs, on the other hand, may just have some training issues. Myth # 13: Starting with food for rewarding will make the dog dependent on it. - Not necessarily true, as you can properly condition your pet to respond well to other things for a reward, such as toys, playtime and the like. Myth # 14: You have to do things first before your dog can follow suit. - This is related to the “leader” myth, which is not necessarily true. It depends on your training and some can even follow your instructions even without setting an example. Myth # 15: Some dogs are just too dominant to follow orders. - All dogs can be trained well, and there’s no such thing as dominance if you give the right approach while they are still young. Q: How do you keep your dog active indoors? A: Indoor play is always a hard thing to do. Indoor activities are only limited so that your dog does not damage vases, scratch curtains and make other unlikely accidents happen. Therefore, when playing indoors, many things should be considered. This is so that your dog will be able to play at ease without the worry of accidents. This is a game in which you hide the treats so your dog will find it. This is a game that requires your dog’s thinking skills to pick the right cup in which the treat is hiding underneath. If your dog knows how to pick up and drop an object then this will be a fun game to play. This kind of toy is more than just a toy, as it can also be a nice treat for your dog. As we noted above, tug of war does not make your dog aggressive, provided you put together good rules so that they don’t get out of control. You can ask them simple errands like opening the fridge, pulling the door and whatnot. Consider adding some mental stimulation twist to the games your dog can play so that they can be able to play it indoors without losing interest. This is a creative way of helping Fido work hard to get his treats. This can be hard, but it is possible because dogs have the audible skills to process words and associate them with things. Along with the above-mentioned activity, you can also challenge them to go find their favorite toy. There used to be a saying that “you can’t teach an old dog new tricks”, but it is really just a myth! It is possible for any dog of any age to learn something new, just like people. Clicker training is one of the things that beginner trainers should have for their dog. Like the cups game, use your hands to cover the treats and then let the dog guess where it is. Hide and seek is always a fun game when it comes down to simple indoor play. You can always buy a nice puzzle game for your dog to enjoy from the pet store. Even if it is the basic form of training, it will still be interesting with your dog. If you have enough room indoors, playing catch is a great pastime, but make sure you don’t hit anything too hard. Or you can just turn it into a game of catch or roll the ball. Like humans, pets can also have arthritis, especially for senior dogs. Learning how to give your dog a nice massage can be a great bonding activity. A shaping game requires a clicker and a box and it gives your pet a nice level of flexibility. You can also groom your dog while indoors on a rainy afternoon when you can’t walk outside. You can also play a game of tag, similar to playing hide and seek. Q: What important accessories should a dog and a dog owner have? Q: What essentials should you have if you have a puppy at home? Q: How do you teach your dog how to catch? 1. Begin by a game of chase to get your dog motivated. 2. Try holding back the ball before throwing for added suspense. 3. Use another toy if he doesn’t retrieve the first one sooner. 4. Use a rope if your dog doesn’t want to return the ball. 5. Use a treat if your dog doesn’t drop the ball. 6. Consider an attractive ball or object to retrieve for your dog. Q: Why doesn’t my dog catch? 1. There could be some health problems with your dog. 2. They may not be interested with the object. 3. They may also have some behavioral problems you need to address. Q: Why doesn’t my dog drop the ball? 1. Your dog might not know the “drop it” command completely, in which you have to teach. 2. If you do take away things by force from your dog, chances are he’ll develop a possessive nature. 1. Try to stop the game for about 15 minutes so that your dog will realize that he should drop the ball. 2. Don’t force the ball or toy out of its mouth, as it is dangerous. Q: Can cats learn catch? a. Choose a timing where your cat is more active. b. Choose an object that your cat wants. c. Copy the cat’s expressions and moves. d. Train them with the word “catch” and they’ll learn to associate it. e. Give your reward, either a toy or kibble. Q: Why are dogs curious? A: Curiosity is something that most domesticated animals, and even wild animals, naturally have. Most likely, your dog will be curious because curiosity is in their genes, and because most of us, even humans, are naturally curious. All living beings are given some manner of curiosity – it’s just that we often see domesticated animals like dogs and cats do it. Q: Which dog breeds are very curious? Q: What should you consider when making your backyard dog-friendly? 1. Address what makes your dog leave the yard. 2. Match your dog’s size, skills and age to the fence building decision. 3. Consider a gate that is not easy for your dog to open. 4. Install a doggie door on one of your main doors. 5. Keep them away from toxic plants like azaleas and daffodils. 6. Keep the yard clean to avoid fleas, ticks and snakes. 7. Add amenities like a play yard or a pond. 8. Give your dog a nice outdoor doghouse for weather protection. 9. Adding paths can help your dog navigate around easily. 10. Designate potty areas for your dog. Q: How do you choose a fence for your backyard for your dog? 1. Know the dog breed that you have, along with the size and temperament. 2. Consider the laws in your area for fence building. 3. Select a preferred fence type, whether it’s concrete, wood, vinyl, chain link, etc. 4. Know if your dog tends to leap or dig through. To wrap things up, the KARMAS Interactive Launcher is our pick for the best automatic fetch machine due to the distance settings and the capability to entertain both your pet and your children due to the intuitive game of catch that you can use it for.